HAMSTRUNG Liberal Democrats have questioned the integrity of the Conservative-dominated council after the Tories tightened their grip on local affairs with victory in last Thursday’s double by-election. Chitra Rana’s narrow 18-vote triumph in Goldsworth West meant the Tories were able to gain a seat in the wake of the retirement of Lib Dem Councillors Amanda and Denzil Coulson in August. The Lib Dems did manage to prevent a blue party whitewash, however, with a similarly tight 32-vote victory going the way of James Sanderson in the Goldsworth East battle. Some 25 of the 36 Chamber seats are now occupied by Tories ahead of May’s local political reshuffle when all posts will be vacated and 30 councillors elected. But the concerned Leader of the Lib Dems on Woking Borough Council, Cllr Will Forster, has cited a new report by the Electoral Reform Society, and claims that local governance is heading in the wrong direction. The document argues that local authorities dominated by a single party waste money – £2.6 billion a year across the country’s councils – and are more at risk of corruption. Research conducted by University of Cambridge academic Mihály Fazekas examined more than 132,000 public procurement contracts between 2009 and 2013, and identified the extent to which ‘one-party councils’ in England could be missing out on savings through their processes. The study also measured local authorities against a set of corruption ‘red flags’ which found that one-party councils are 50 per cent more at risk. Cllr Forster said he completely agrees with the report. He added: “The Conservatives are using the comfortable majority on the council to undermine scrutiny and stop transparency as much as possible. “Only last year the Conservative Party rewrote the constitution to stop the Overview and Scrutiny Committee being led independently of the governing party. Looking back to Thursday night’s late entertainment, it was certainly not for the fainthearted, with just 50 votes separating the four frontrunners across the two vacancies up for grabs. Lib Dem Tina Liddington’s 349 votes came up second best to new Cllr Rana’s 367, the 18-ballot margin ensuring a tense count. Meanwhile Labour’s Robina Shaheen picked up 105 votes while UKIP’s Troy De Leon brought up the rear with 97. The turnout was a meek 24.98 per cent. In the Goldsworth East showdown the Lib Dems held on to their post by 32 votes; Cllr Sanderson’s 594 ballots seeing off the competition of Tory debutant Sonia Elbarake (562). Labour’s James Butcher amassed 262 votes while UKIP again finished with the wooden spoon: Timothy Read ending proceedings with 154 votes respectively. The turnout was 28.8 per cent. Conservative Council Leader John Kingsbury was quick to hail a ‘stunning victory’, telling the News & Mail that the numbers do not lie when it comes to identifying who residents want at the helm. 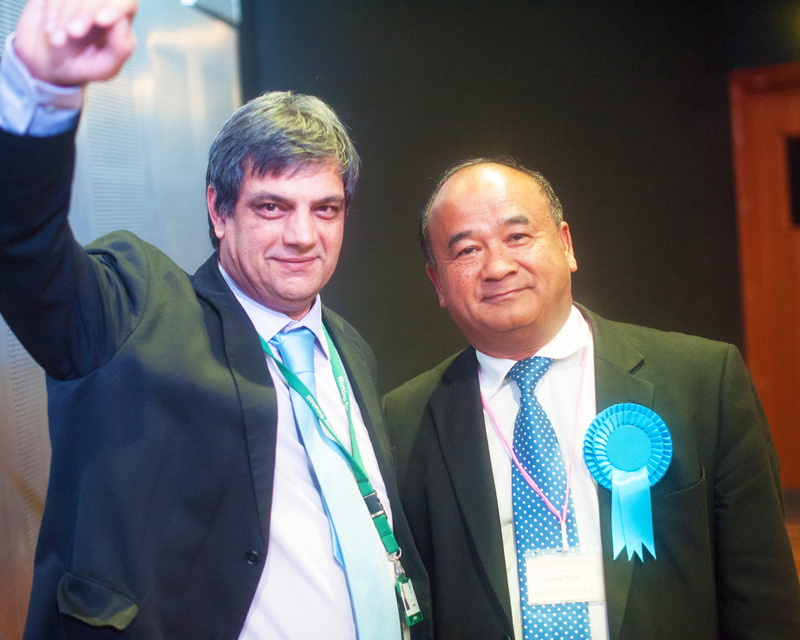 He said: “A stunning by-election victory was enjoyed by Woking Conservatives last Thursday, when former Gurkha Officer and local campaigning activist Chitra Rana won a seat in Goldsworth West from the Lib Dems. “The seat in Goldsworth East, also being contested, was narrowly lost by our first-time candidate, Sonia Elbaraka, who fought a great campaign and is relishing the prospect of standing again for election in May 2016 following ward boundary changes. Cllrs Rana and Sanderson were declared elected by Returning Officer and council Chief Executive Ray Morgan on the night.